Over the last few years you may have seen in your news feed on Facebook images and status updates promoting programs like “Shop Local” or “Shop Small”. My favorite promotional piece for these programs/movements is when the composer suggests that by be coming a patron at a local or small business you are helping to stick it to the man by helping a little girl somewhere “get dance lessons” vs. the Walton family buy yet another home. There is a program promoting small business with “Shop Small Saturday” that designated a Saturday during the year where they encourage consumers to shop small/local. 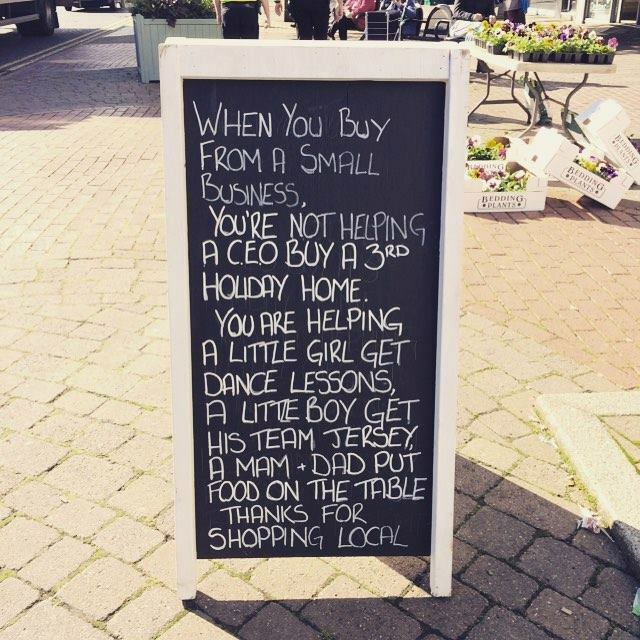 As a small business owner I applaud the effort to promote other small shops but there is also a flaw in these movements and that is that they forget there is a vast difference in “small” and “local”. If you are here on this site reading this then you know I’m am a small business owner and that I sell my custom handmade leather motorcycles masks on this site, if not you might wanna pay closer attention to the links you click on. This business has been going for a coupe years now and I’ve been growing in surprisingly large leaps year over year. I am truly amazed and honored by the willingness of people to spend their hard earned money on a random stranger’s products. It simply stuns me sometimes how interested people are in buying what I have to offer, I am of course confident in my product but it humbles me to know that others are too and are willing pay for it. Let me also say that I was raised in a small town in Idaho and I watched small/local business in our town come and go one after the other. It was almost laughable how quickly some business flared and fizzled in our town. Basically our town was small enough that you only shopped small/local. Our town wasn’t big enough for many national companies to setup shop… in fact I can’t think of any, McDonalds didn’t even last that long. So when I say that I know what its like to shop small/local I know what I’m talking about. But when Walmart opened a location over an hour away the cost to shop local was still so high that it was cheaper to drive that hour to get our stuff than to shop local; and there is the problem and the difference between the intended message of these shop small/local movements and reality. People don’t want to, and frankly can’t, spend more for something just because its local when compared to driving a short distance, one hour in Idaho is considered short mind you, or waiting for a purchase to be delivered from an online purchase that was a better price. Lets consider a small/local company that sets up shop in your town, the size of the town is irrelevant really, and this store sells general stuff; nothing in particular, no focus, just a small/local version of Walmart. This hypothetical company is a one-off store and since they don’t have the buying power of Walmart their prices are higher. The owner opens his or her’s doors to big fan fair. The mayor of the town in which this store opens comes and cuts the ribbon and the grand opening, the local news paper does a feature on the new store, the owner is applauded for taking a stake in the town and business is great… for a week or two. Then the doors suddenly aren’t opening very often and the owner starts to get nervous and runs a sale which doesn’t curb the lack of traffic through those doors. Within a few months the store quietly closes and the owner is overheard saying how hard it is to “run a respectable business” and how people “didn’t support the store” and its “a travesty that big box stores are killing small business”. To that I ask “well, what did you expect?”. You might think that is kinda harsh, after all I just said that my own business is growing and clearly I’m just lucky and/or being mean. No, that isn’t the case. My position is this: what value are you offering in return for the higher prices? The typical small/local business owner would say something cliche about how they offer “a better experience”, “better customer service”, or my personal favorite “a personal touch that you just can’t get at the big box stores.” But honestly that isn’t enough because, speaking generally, people put higher value on their pocket full of dollars than your friendly smile. I don’t know these people, just snagged the pic from Google Image Search for effect. So if your smile and friendly demeanor as a store owner isn’t worth the extra 20% you are charging for xyz product what should you do? Well honestly I think you need to do one of two things: consider whether your business is really viable or adjust your expectations. Its annoying and quite honestly insulting for people to stand up and say “buy from me because if you don’t my daughter won’t get braces” or “…has to forgo dance lessons” when you are expecting the customer to pay 20% more for the same thing they can get at Walmart and no added value. If your inventory is made up products like this then maybe its time to scale down the operation to only the size required for those willing to pay the increase or who find themselves needing something now. For example a small auto parts store in my old home town could do really well in this way, by keeping their operation small so that I, as a gearhead, could run in and grab the things I need quickly knowing that my lack of forethought/advanced planning would cost me a little bit more. Additionally that auto parts store might massage and curate their inventory towards those needs. These are not revolutionary concepts of course, this is basic business management but what about someone that say goes to events and sets up a booth? My grandparents on my mom’s side are wonderful people both possessing amazing talents and creative natures. My grandfather is a wiz in the carpentry shop building amazing things out of nothing more than scraps. He use to say he could make saw dust like no one else but the truth is he can make almost anything like no one else. My grandmother has a beautiful eye for art and with a background in oil painting she picked up acrylic paints and found that if they teamed up she could create amazing art on my grandfather’s carpentry projects. Together they toured western state’s events in the late 80s through the mid 90s selling their creations and doing quite well with it. Now, my grandmother could charm a snake, if she could stand to be around one long enough to do so, and her smile makes me happy, even now thinking of it makes me smile return, but her smile wasn’t what made them successful. People were not wondering around looking at and buying these handmade items because of “great customer service” or “a friendly smile” they bought them because they were relevant products that fulfilled a need or want in a unique way that added value. What I mean by that is when you go to the grocery store and you are considering buying some chocolate chips with which to make some cookies do you just grab the crappy basic brand or do you, even for a moment, look to the best and highest quality chips? Most likely you pay the premium price for the better chips because you put value on the taste of the chips in your cookies. That is a rather trivial and cheap example so what about car buying? When you arrive at the dealership most buyers do one of three things, they set clear expectations about what they can afford so as not to be tempted into the better more expensive vehicle, they still mange to get the simple cheaper car after having been seriously tempted to upgrade, or three they make some exceptions and buy the nicer car (I speak from experience in all three groups); all three options are based on knowing there is a more to be had by spending more because of the perceived value added. The same thing happens with buyers all day long every day 24/7 the world over. Buyers are open to spending more, at least at a subconscious level, under basically all circumstances if they feel there is more value. 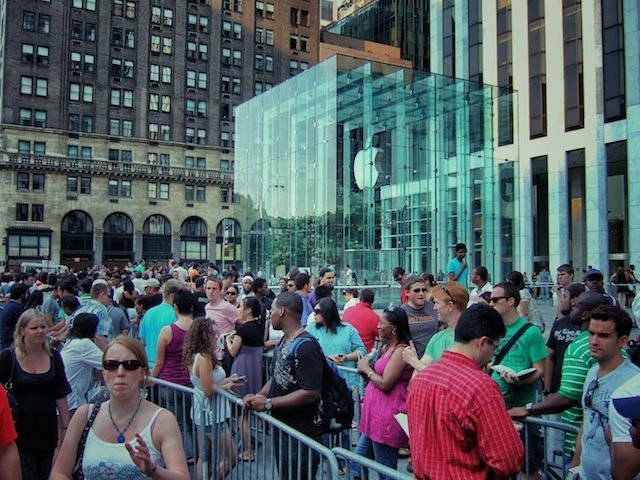 What’s more, if the perceived value is very high the buyer will even clamor and fight to spend more money on those things, see every iPhone release in the last 8 years for proof. Again, snagged image. I don’t claim ownership here. Another thing “buy small/local” programs fail to consider and thus fail to promote is that not all, or even “most” these days, small business is local. There isn’t a store front with my company name on the front, all of my masks are sold online. The same can be said of the mom-prenuer that is selling handmade hair bows on Etsy from her kitchen table. Now you might argue that both of us are still in fact local in the same way Toyota is still considered and “import” auto manufacture even though large chunks of their vehicles are made in the USA now. Sure, I can accept that but that doesn’t change the fact that these programs present “small business” to be synonymous with “local business”. When I decided to sell motorcycle masks I did so after doing market research like any good entrepreneur would. I analyzed the market and found that there was room for me, my product, and the price point I wanted to play in. There are no guarantees in business of course but there is also no substitute for research and preparation but even before all of that you must be realistic about your goals. If all you want to do is own a business and you open the store like described above then even if the numbers and research say you might be able to do it then you are probably going to have some problems. I believe that ultimately it all comes down to what you are offering and how you are offering it. So even though the market research suggested it might work I had to bring something new to the table because if it was just run of the mill Walmart stuff why should they be expected or encouraged to buy from me? Buyers can get a leather motorcycle mask from several makes, some are more and some are less handmade than mine so even that isn’t enough to encourage people to pay a premium to buy from me. What is? There are two reason people buy from me and they are 1) my masks are designed specifically for motorcyclists rather than just masks that can be used for riding and 2) I’m the only place you can get a Deathstroke mask as well as the only place you can get any of my uniquely designed tooling patterns, all of that is proprietary and copyrighted elements. How I make the masks and the materials I use are basically available to anyone its the proprietary elements they are buying from me. This isn’t a essay on how or what to do when starting a business. What it is and what I’m saying with all of this is that the next time someone stands up and says that you should buy local/small understand that those are actually wildly different things. The encouragement to “buy local” seems to me to be a futile effort to save something that really shouldn’t be saved where “shop small” is an encouragement to look to small businesses for unique solutions to your needs that might just be worth paying a premium for. The fact that something is local only has one thing going for it, its local and sometimes that is worth the price increase but mostly its not. Footnote: The above comments are not totally inclusive of certain types of business like say a coffee shop or diner but while that line between local and small might not be quite as clear it still should be noted that nobody wants to pay out the nose for a burger unless there is something great about it. But when it comes to business with a product to offer my experience is just wrapping it in a smile isn’t enough and that shopping “local” means you forgot to get it online.